So, maybe we were bored. Maybe inspired. Maybe a little crazy... We decided to build ourselves a robot. Ok the idea didn’t just suddenly pop into our heads one Friday night. It has actually been a rather long logical path that ended in the robot. Now I’m not saying that the thoughts were logical, I’m just saying the path that led to them was. 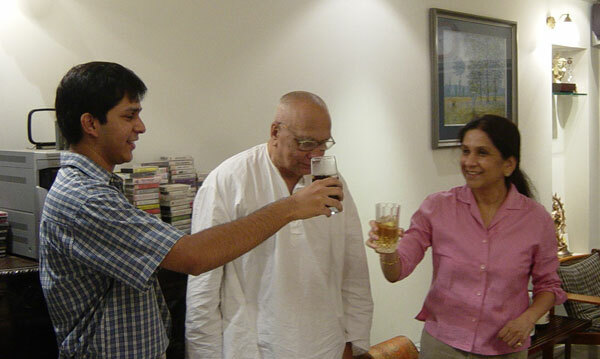 It all started one fine day sometime around March 2004. 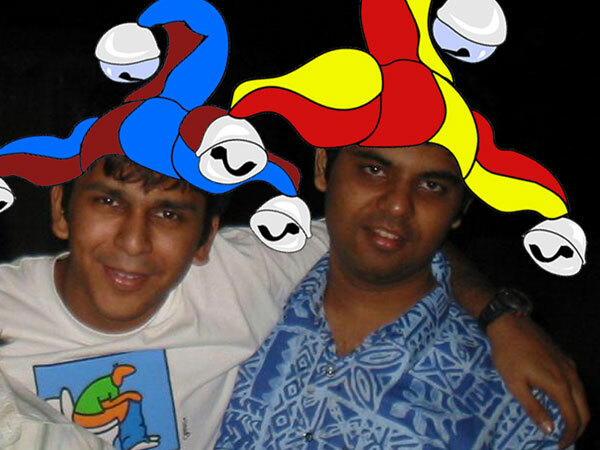 My pack of friends includes 2 jokers namely Rajiv and Siddhant. Since Siddhant is a bloody long name to type often, I shall henceforth refer to him by the name “Pok”. "Hey, c’mon cheer up buddy - at least your hat's bigger than mine..."
“What the Pok?” you might say. Yeah I know, but that’s what we all call him. To be completely fair, as required by my Libran stars, we shall mutate the mutant Rajiv’s name suitably to Ranji, and they call me Jam I hear. Pok : is ranji ready? Jam : what was that again? Pok has left the conversation. Clearly you can see that Pok is an idiot who finds perverse pleasure in first raising the simple hopes of simple people like us engineers (back then! ), and then once we are all hopeful and ready to play he shatters our dreams the way his teeth need to be. He seems to have perfected this art. Agreed. We should first build a transmitter before wasting our time building any machine to control using it, cos without the Transmitter (Tx) we can’t do anything anyway. So we delved into many hours of research and dug up a ton of designs online. But they all had these nasty things called inductors. And neither of us knew how to coil our own inductors, so the radio Tx thing died after a while, and we found ourselves engaged in more intellectual conversations with Pok like the one I presented above. "Muhahahaha Pok! I know where you live...."
Pok : My father has ripped out all the internet cables on the terrace and broken the hub in two. His dad is an orthodontist, before you get ideas. He’s also the building secretary, impatient and not very tech savvy. A wall needed to be painted, the wires were in the way, so… rip them out. He didn’t do that to my teeth luckily when I went to him for my braces. It was now August, and my “multiplayer gaming” had been reduced to Yahoo Literati (Scrabble, for the uninitiated) with my then-GF. Things looked bleak. The robot he built with his VJTI pals looked like cross between a rickshaw and an ancient expansion card served on a steel tray of the sort used in Udipi restaurants, with a few bits of thermocol here n there to make it look more complex and deserving of being labeled a robot. I’m not joking. It was literally a steel plate with some thermocol taped on at strategic locations to support a PCB, 2 motors, 3 wheels and 4 IR sensors. The sensors were on its underside to detect a silver strip it was supposed to follow along the track. 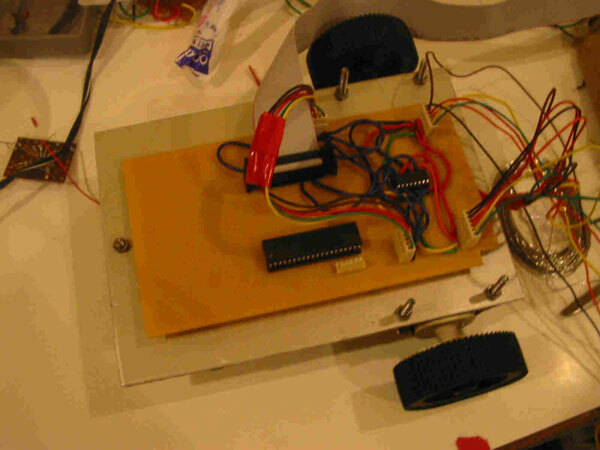 It was wired to an 8085 kit that did all the processing for it and it had an external power supply. Rajiv was not impressed. He wanted more. So once that fiasco was over, he decided he’d like to involve me in the next one… err, robot. That’s what friends are for after all. 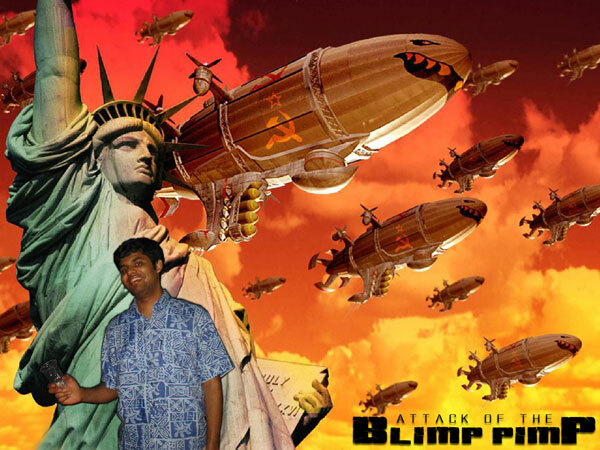 The image used behind Rajiv in "Attack of The Blimp Pimp" is a screen capture from the opening cinematic of Red Alert 2, copyright for which is most likely held by the game's publisher or developer. This image seems to have also been released as a wallpaper by the game's publisher or developer, and is freely available on the internet.